Today I ran into a few problems when trying to setup an ex employees iPad for a new employee. You could say the problem was caused by myself for not getting the ex employee to remove their passcode but it’s helped me learn a new trick and I thought I’d share it with you. I have an iPad with a passcode on which I don’t know so I can’t access the iPad and I want to use Apple Configurator to set it up for someone else. This problem was made more complicated as ‘Find My iPad’ was enabled on the device. So Apple Configurator came up with an unable to check iOS error. To resolve this issue I had to put the iPad into recovery mode. To do this you need to follow these steps. – Turn off the iPad in the normal way and disconnect all wires from the iPad. – Setup Apple Configurator in Prepare mode making sure to select update this device when in recovery mode and tick erase device. – Now with the iPad still turned off press and hold the home button on the iPad and plug in the lightning/USB adapter. – Apple Configurator should now recognise the iPad and the iPad screen should be showing the iTunes icon with a cable. 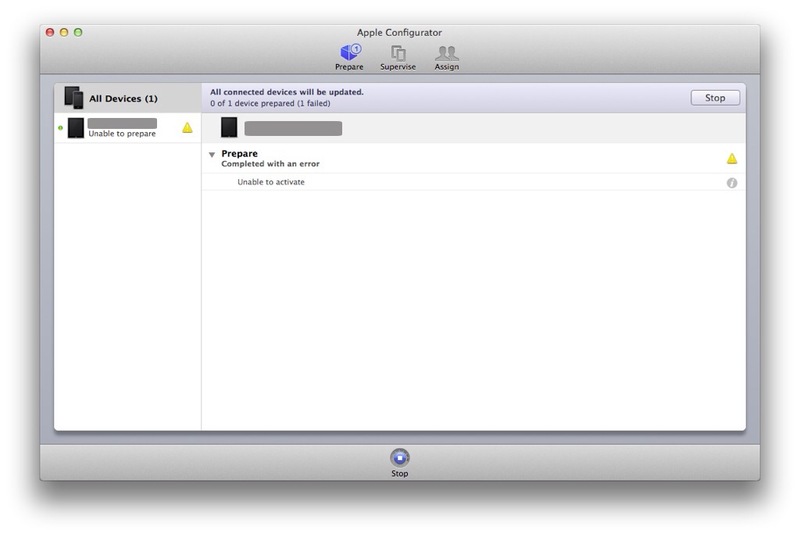 – Now you can tell Apple Configurator to prepare the device and let go off the home button. – The iPad will now be configured as a new device but will still not function correctly as the device is still registered with the old users Apple ID. You may get an unable to apply error due to activation error. See image below. – If the Apple ID is an email address on your domain you can setup a forwarder or reset the users password to gain access to the email address for the next step. Otherwise you will have to talk to Apple. – You now need to goto appleid.apple.com and click reset your password. – Type in the Apple ID and click next. – Select email authentication and click next. An email will be set to the ex users email address and hopefully you can access this either by logging into their email with a password reset or from a forwarder to yourself. – Follow the instructions in the email on how to reset the Apple ID. – On the iPad now work through the setup screen and you will come to an activation message saying the iPad is locked to that account. – Fill on the details with the Apple ID and password you just reset. Complete the setup process. – Now the iPad can be used as normal and setup for a new user via Apple Configurator without any errors. Thanks for taking the time to read this blog post. I really appreciate any likes, comments, shares, subscribes and follows. This will help you stay up to date with my latest app reviews, walkthroughs, lesson ideas and more.